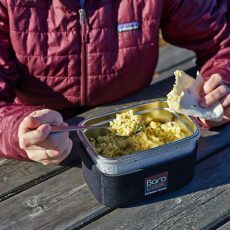 We get a lot of questions about the kitchen set we use while backpacking. 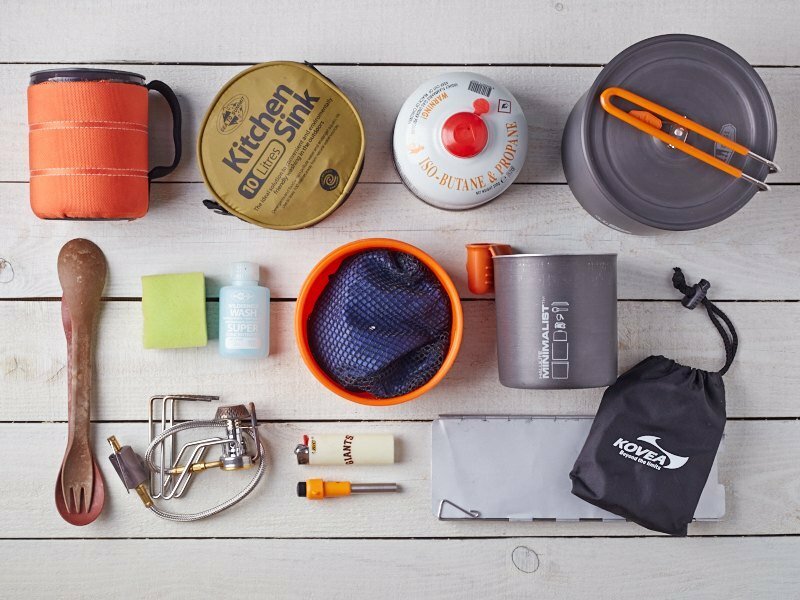 We have made a list of cooking gear to take on our multi-day hikes in the wilderness, which may not be ideal for everyone. 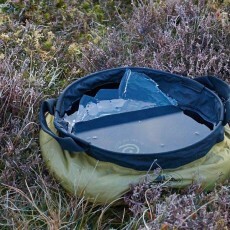 It is certainly not lightweight, but we created it based on our experience and needs. 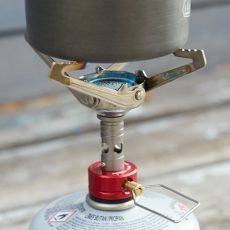 The type of stove we take with us is a lightweight and very compact remote canister stove suitable for all 4 seasons. 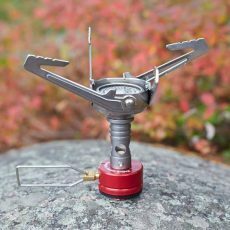 Since we mostly hike in mountainous regions and sometimes beyond the Arctic Circle, where the temperature can drop below zero even in summer, this type of stove works best for us. In harsh weather conditions, which we face quite often, a windscreen is not optional, it’s a MUST. 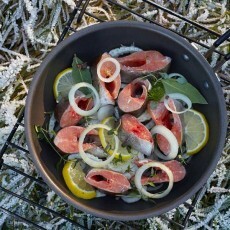 Furthermore, using a windscreen can significantly speed up the cooking process. 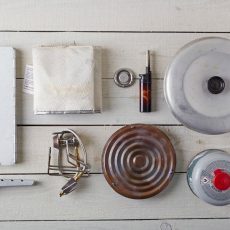 Usually we take 1 or 2 containers of fuel with us depending on how many days we are going to spend in the wilderness. 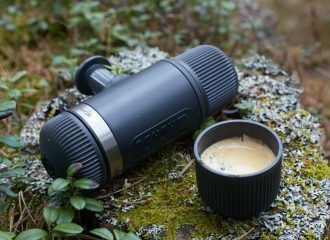 For a 9 to 10-day trip two (14 oz.) canisters are more than enough. We use regular lighters such as BIC. Take two in case of emergency. 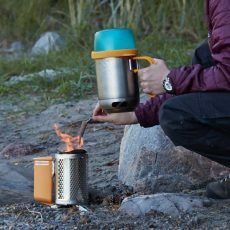 An ultralight pot is perfect for boiling water and cooking simple meals for two adventurers. 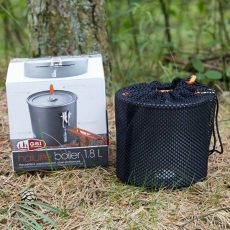 It is lightweight, compact and fits inside the Halulite Boiler 1.8L. 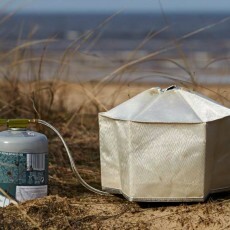 We use it mainly for water boiling / heating. 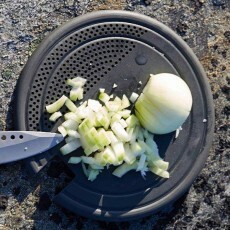 Despite the fact the second pot may seem an excess and unnecessary, it is a very convenient. 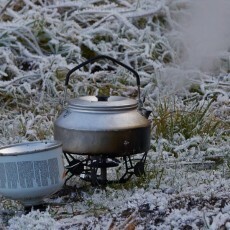 For example, after dinner, we don’t need to rush to wash the pot in order to heat water for tea. Bowls are not necessary if you can eat from one pot, which is what we usually do. 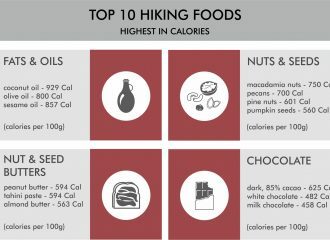 However, portioned breakfasts, such as granola or oatmeal, are more convenient to eat if you have your own bowl. We like Kupilka Sporks. They are made from a super lightweight and durable composite material. 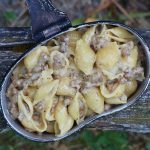 But we never use the tongs on a spork since there really are no types of food on the trail that one could not eat with a spoon. 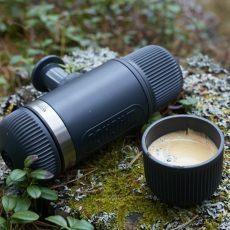 What could be better than a cup of morning coffee with a nice view? 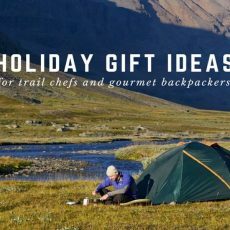 We like to enjoy this moment and therefore we can’t be without our mugs while backpacking or replace them with bowls. We have more than once been convinced that a kitchen sink is a very convenient and versatile item. 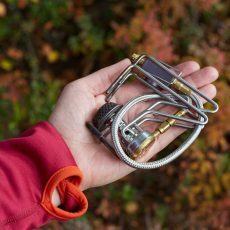 It is great for carrying water from the source to camp (especially in the mountains, where the stream may be quite far away, washing dishes and for personal bathing. 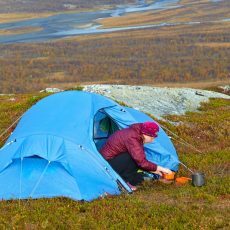 If your route runs through fields and woodlands, where there is plenty of vegetation, you can wash dishes without soap and a sponge. 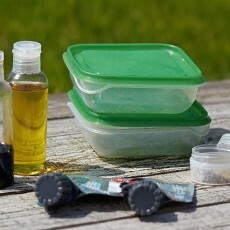 You can clean them with what you can find on the ground: grass, leaves, needles or sand. 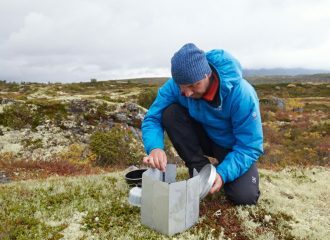 But in the mountains, there is little or no vegetation, this “magic pair” has helped us many times. As we know, in a humid environment microbes and other pathogens grow faster. Therefore, dishes should be thoroughly dried before you pack them up. A small microfibre towel will handle this task perfectly. 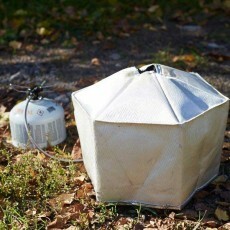 I love Trangia; heavier but with alcohol fuel so no more gas canisters unrecyclabe for trash.